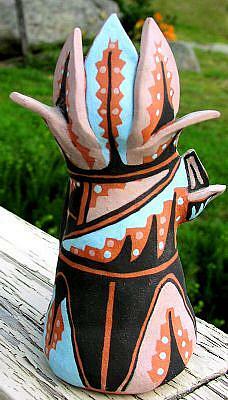 This clay sculpture *storyteller doll is hand built of red stoneware clay using the coil method, painted with matte glazes and then fired. The sculpted kernels of corn, the husks, and the painted decorative elements are representative of spiritual symbols prevalent in the culture of the Hopi tribe and have been integrated into the design. This sculpture is part of my personal collection. *In the Native American Pueblo communities in the Southwest, traditionally, storytellers held a place of great importance. The older members of the tribe would help preserve the culture and heritage of the tribes by telling traditional folktales and historical stories to the younger generations. 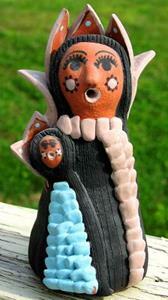 A storyteller doll was usually a small clay sculpture of a man or a woman. The figure always was depicted with its mouth open to indicate that it was entertaining listeners with songs or stories that conveyed the culture of the people. The storyteller was always accompanied by either one or several "listener figures." Usually, these listeners were children that were being taught by the elder storyteller.